Size: 22.2 x 29.4 cm., 15pp., a copy with contributions by Yamamoto Kanae, Morita Tsunetomo and others, published in June 1908. See "detail" for the cover, showing an oil painting by Yamamoto Kanae. The format of this magazine was designed by Ishii Hakutei, using the German magazine Jugend as his model. 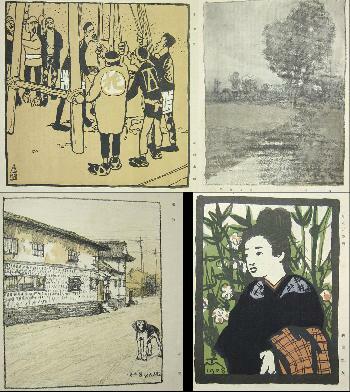 For the importance of Hôsun see Helen Merritt, Modern Japanese Woodblock Prints, pp. 114-119.